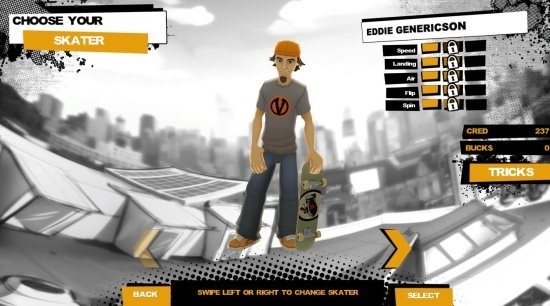 Endless Skater is a Windows 8 game app, available for free in Games category of Windows Store. Roll through the streets with your skate board in this game and perform stunts while you do so. 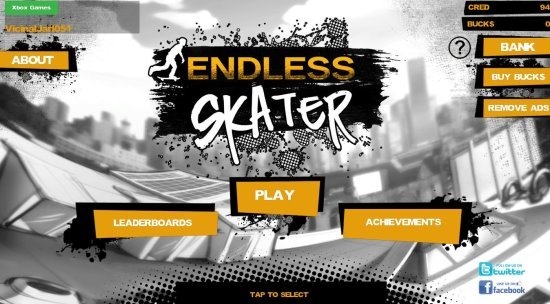 Endless Skater consists of two scenarios: School and Rooftops, where you can perform flips, jumps, etc., and get through as many levels as you can. As the name suggests, there are endless stages for you to play and enjoy skating. Make your high scores and longest runs to register your name on top skaters list. Once you finished installing Endless Skater, launch the app. You will be asked to choose from five characters: Way, Malto, Lyn-Z, Hosoi, and Decenzo. Then you will see the app screen as shown in above image. Top right you can see the credits earned by you and bucks in your account. You can check the special moves achieved by you in the Achievements section. The top scores can be viewed in the Leaderboards. Click on play to choose skater or upgrade their skills as shown in below screenshot. Here you can select your skater or improve his speed, landing, air, flip, or spin using the credits in your account. The credits can be earned by playing various games and stages in Endless Skater. Click on Tricks option to unlock tricks using your credits. After you are done, click on select. Then you have the option to go through a tutorial. You can also slide the screen to change to different scenario. Stay in the field without falling down and earn credits. Also look out for the endless and timer gameplays to skate according to rules. Now proceed to play the game. Press Down or Up arrow keys to start skating. 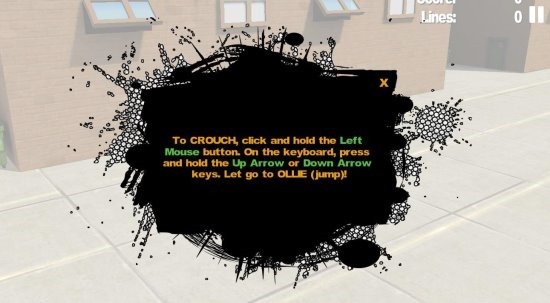 Alternatively you can also use left mouse button to start skating. Hold the Up or Down arrow and release it to make jumps. Alternatively, hold the Right or Left mouse button and release to jump. Use the left and right arrow to shift to different lanes. While jumping press the left or right arrow keys to perform flips and stunts. This Windows 8 Game app is free. Endless stages and gameplay, with beautiful designs and graphics. School and Rooftop scenarios to play. Lots of stunts and jumps to play in different stages and places. Click on this link and then use the View button on the page. Then the app opens up in Windows Store of Windows 8, then install it and start playing. Also try: Windows 8 Chess app and Windows 8 Air Hockey App.